A pole tent is a pole tent, right? Wrong. Tent tops that are supported by center poles and side poles and a perimeter guy system have been around longer than anyone reading this. 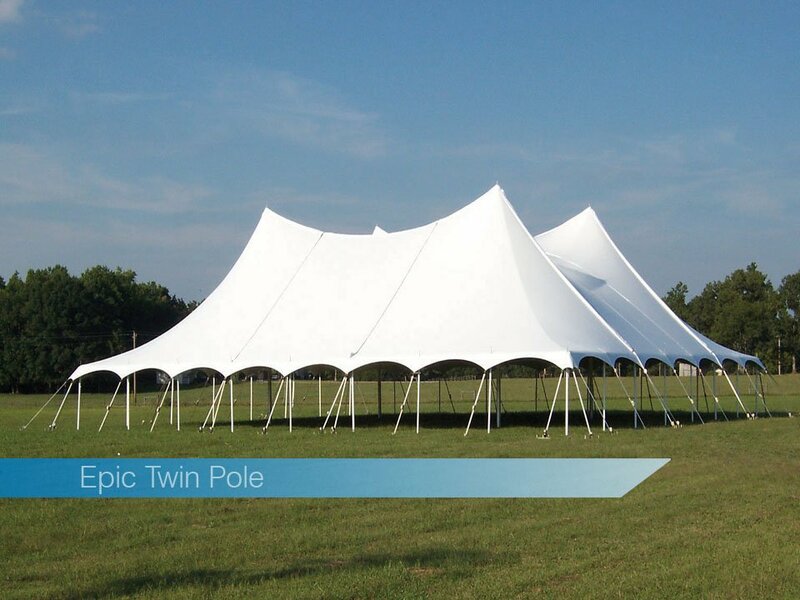 We call them pole tents, which covers a wide variety of systems and styles. More specifically, we will concentrate on tension tents here, which are pole tents with structural elements that allow them to meet strict guidelines for engineered wind loads. Today’s tent landscape includes such advanced materials that some could say tension tents are as advanced in many respects as some of the popular keder frame tents on the market, which we wrote about last month. Structural fabrics, reinforcing plate systems and heavy duty webbings, used in a very specific way in the construction of the tent can yield a tension tent that can meet exceptionally high wind loads and can be installed in some long-term applications without worry. All pole tents aren’t created equally. Tension tents, while being loosely defined as pole tents in the sense that they are supported by side poles, center poles, and tensioned with a worthy perimeter guy system, employ very specific construction methods that create a superior network of webbings throughout the top. Those methods are dictated to the manufacturer by the designer and engineer of the system and have to be followed exactly to produce the engineered tension tent. That network of webbings is often joined to plates that tie them together so they create the “bones” of the tent. The structure created works as a cohesive unit that will resist very high winds and will give the owner many years of service. As with any tent, the system is only as good as the installation, so make sure your crews are adequately trained and follow the manufacturer’s requirements closely. Remember to test and monitor soil conditions and choose an anchor system that is up to the task of providing the load resistance outlined in the engineering documents. Copyright © TopTec Products, Inc.